What's New @ Andruss Library: HELP! I can't find my document!!! HELP! I can't find my document!!! Students often come to librarians in a panic because they can't find a document they were just working on. What's happening? 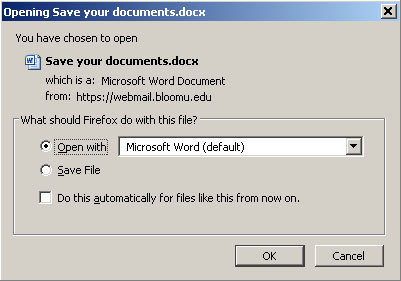 Usually they have opened a document from their email, clicked on 'Save' at the prompt, worked on it, closed it, and then tried to open it again only to discover it's gone for good. 1. 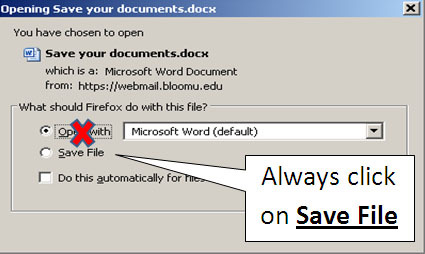 When you open a file from your email to work on, immediately at the prompt click on 'SAVE' to save it first to 'My Documents’ or your 'P drive'. Do not ‘OPEN’ the file at the prompt as it will only be saved as a temporary file (even if you afterwards click 'save'), and it will not be available once it's closed. Remember to always click 'SAVE' first! 2. 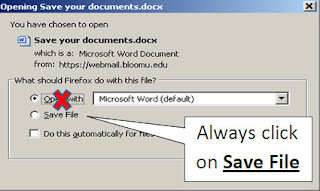 If you forget and 'OPEN' instead of 'SAVE', then just remember to choose the option to 'SAVE AS' (not 'save') when saving your document to your 'My Documents' or 'P Drive'. Any questions, ask a Lab Tech at the 1st floor desk.